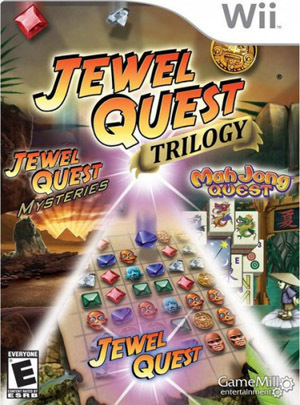 Jewel Quest Trilogy is an all new hidden object series based on the popular, best selling Jewel Quest franchise! Playing as Emma, you reveal Rupert and Emma's past in their early search for the original Jewel Quest boards. With clues from the early jewel board as their guide, each game will set the player on a world hopping adventure to find a single jewel from the original set, uncovering the story of its unique place in history along the way. Jewel Quest III: The quest continues with Rupert tracing through his family lineage to prove that he is the rightful owner of the jewel board. Travel around the world with Rupert to exotic locations in his adventure to reclaim ownership of the board. Mah Jong II: Join Kwazi as he works to restore the balance of the world. This imbalance has caused him to split into polar opposites; Kwazi White and Kwazi Black. Through the solving of Mah Jong and using both halves to cooperate, you can unlock the mysteries of the moongates. The graph below charts the compatibility with Jewel Quest Trilogy since Dolphin's 2.0 release, listing revisions only where a compatibility change occurred. This page was last edited on 16 January 2018, at 11:46.